Special features of the structure of surface layers formed on billets of commercial-purity titanium VT1-0 by cladding a powder aluminum-titanium mixture with an electron beam removed into air atmosphere are studied. 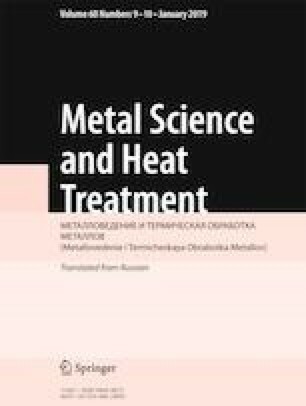 X-ray phase analysis and transmission electron microscopy are used to show that the material remelted by the electron beam is Ti3Al titanium aluminide. The hardness of the deposited layer is 540 – 610 HV. The behavior of the material is studied under the conditions of sliding friction and friction against fixed abrasive particles. The results reflect decrease in the friction factor and increase in the wear resistance of the clad material as compared to commercially pure titanium. Translated from Metallovedenie i Termicheskaya Obrabotka Metallov, No. 10, pp. 4 – 10, October, 2018. The work has been performed with financial assistance of the Russian Foundation for Basic Research within Scientific Project No. 15-38-20776mol a ved.